The hall of a nightclub turned into an interactive canvas for live animations drawn by the passing and moving bodies. Commissioned by White Nightclub, Beirut. 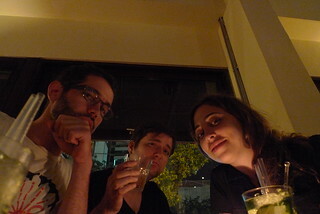 Ayah, Aaron and I take a night off to have a drink at Cafe de Prague in Hamra, Beirut. She described this as "a total hipster bar," which is, of course, why she took us there.